How do I register as a Partner? 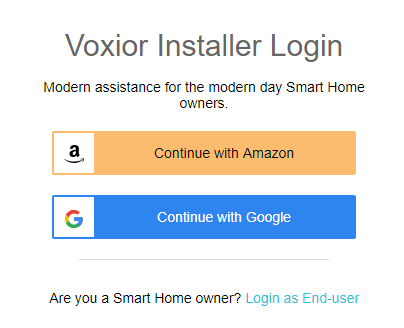 By registering as a partner you get access to a 7-day free trial of the Voxior Pro Dashboard for your KNX and Loxone Smart Home. You can test all the needed features for yourself and your clients before getting a licence. 1. Open the Partners Page to start your registration process. 3. You can use your Amazon email account or your Google email account for logging in. You can always login to Voxior by navigating to our Voxior app at https://app.voxior.com/. If you would like to use the Voxior Pro Dashboard for your clients you first need to add them. Here’s a Guide for adding clients. If you would like them to use Voice Control, here’s a Guide for setting up their gateways and managing them.